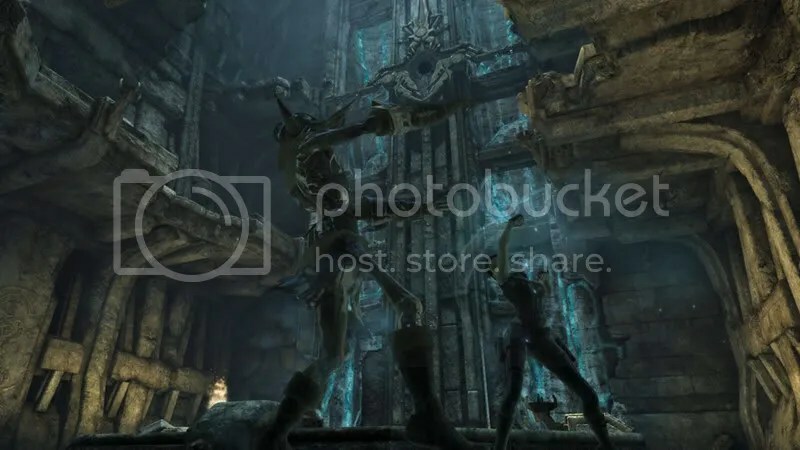 Posted by tombraiderfanboy in 360 DLC, Underworld. The official site‘s just put up an update on Lara’s Shadow, the second of two 360-exclusive DLC for Underworld. From the sound and looks of it, the doppelganger will be packing more than the twin pistols and Lara’s 13-year old acrobatic skills. Now you’ll be able to slow down time and “massively increase the speed and force of her devastating melee attacks.” Gunfight will be replaced with the “Shadow Fire” feature, which is basically a weapon with “speed, accuracy and impact” that “shatters impossibly dangerous enemies into pieces.” You’ll also be able to go to places “too dangerous” for Lara to ever reach using the doppelganger’s “Shadow Power”. It’s sounding like the most un-Tomb Raider-ish iteration of the series ever to be conceived. Funny thing is, that’s what’s getting us hyped for it. More screenshots through the official site jump. Be sure to drop by the 360 DLC news bundle page to brush up on the latest on Lara’s Shadow. TombRaiderFangirl’s Beneath the Ashes review can be read here.